If you thought the world’s most compact, all-terrain side-by-side pram couldn’t get any better, you’d better think again. 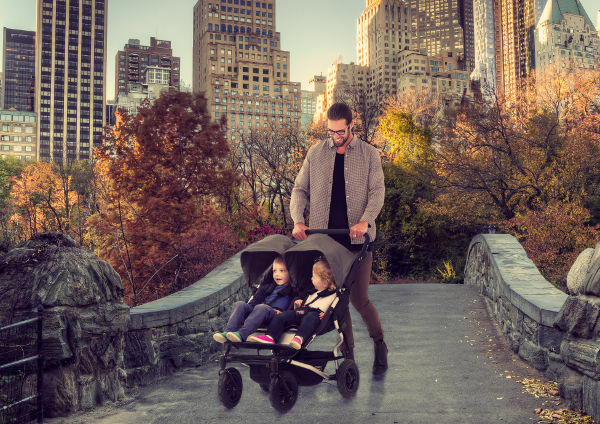 If you have one child or two children, you will love what Mountain Buggy has done to improve the longevity and functionality of this very clever pram. It’s safe to say we already adore the new Mountain Buggy Duet. It may be compact, but it packs quite the punch, all while remaining no wider than a single pram. In fact, the wheel base is just 63 centimetres wide. That’s really incredible when you think of how bulky and cumbersome some side-by-side prams can be. 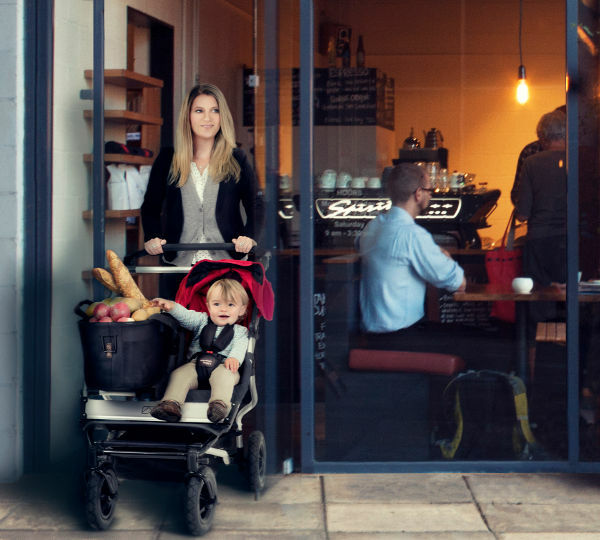 The revamped Duet and incredible accessories have ensured this brilliant pram has forged a whole new niche in the market. 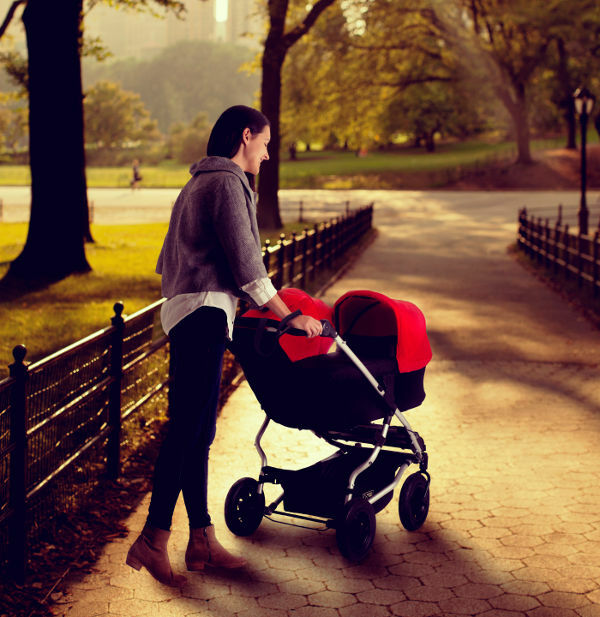 Not just a pretty pram in a compact package, the Duet also ensures that durability, manoeuvrability and adaptability all remain at the forefront of its design. The Duet can go from a double to a single pram in pretty much the blink of an eye. And if you want to ensure every inch of the pram is earning its keep – even when in single mode, you’ll love the Joey accessory. It’s an additional clip-on tote bag, which gives the Duet a heap of storage – that’s it pictured directly above – pretty cool! Another new feature in this model is the ability to fold it using just one hand. And every parent knows how import it is to be able to do anything (and everything) with one spare hand! Also giving the Duet another tick in the functionality department is the Mountain Buggy Carrycot plus. Don’t think that just because this pram is compact it can’t be adaptable. The one frame can accommodate two fabric sets, and three parent facing options. 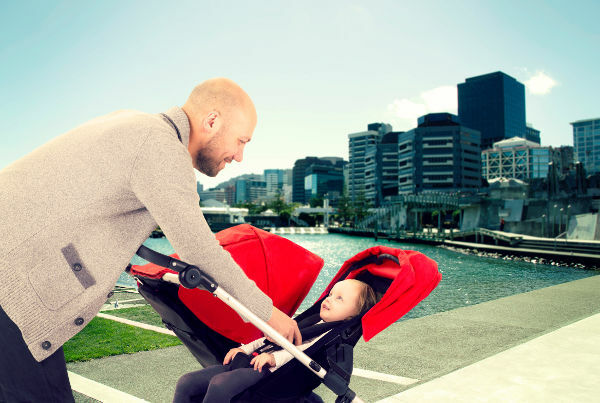 It can be used in the standard lie flat position, an inclined option and as a parent-facing seat for when children get older, but still want to see mum and dad. The Mountain Buggy Duet is priced at $749 and is available for purchase online through Mountain Buggy.